Christina Marie Moses and the cast of The CW’s new series, Containment, were at WonderCon 2016 to show off the pilot and talk about the show, which from what I saw in the pilot is pretty promising. The series, which stars David Gyasi (Interstellar), Chris Wood (The Vampire Diaries), Claudia Black (The Originals, Farscape), George Young (Casualty), Hanna Mangan Lawrence (Spartacus: War of the Damned), Kristen Gutoskie (Beaver Falls) and Trevor St. John (One Live to Live), follows an viral epidemic that breaks out in Atlanta, leaving a large portion of the city quarantined and those stuck on the inside fighting for their lives. In this interview, Moses talks about the show and her character, Jana, the backstory and why she connected to the role. When you read the script, what drew you to the role of Jana? Christina Marie Moses: I loved her strength and her vulnerability and the vulnerability that she’s not even aware that she has. And I just find that complexity so human, it’s something that we can all relate to and I wanted to tell that story. Jana is able to outsmart the virus for a while at least or maybe the whole time. Her survival skills that she gained growing up being passed from one group home to the next, combined with just her logical brain, you know, she’s a data recovery specialist. She knows how to program and think ahead so it makes her have really, really good decisions, I’ll say that. And she’s a badass and I love that. But she’s also a real person with real issues that have made her the way she is. There are assets and liabilities and she is a survivor and she is very introverted, which is something that I actually relate to, I’m a social introvert. I gain my strength from going from within first. So, she is very much like that but to the end degree. She only has like a handful of people that she can let in and trust. Just to be able to tell the story of a woman who learns how to open her heart more and to trust people and still maintain her strength, I think that’s great. I think that’s what really drew me. I didn’t really know to the extent because we only had the pilot script, but the breakdown was like… she becomes an unlikely hero or a leader despite wanting to. I was like, “Oh that’s cool. I can have fun with that.” And I get to fight and I get to do some stunts and that’s awesome. Christina Marie Moses: Well, I read about data recovery because I’m not anywhere nearly remotely capable of doing anything like that. So I wanted to know more about that and what that would actually entail. In terms of hacking, no, I didn’t really learn how to do that. It’s integral but it’s not… It’s more the relationships and her arc of opening and becoming a leader so to speak, that’s what’s really more important for her. 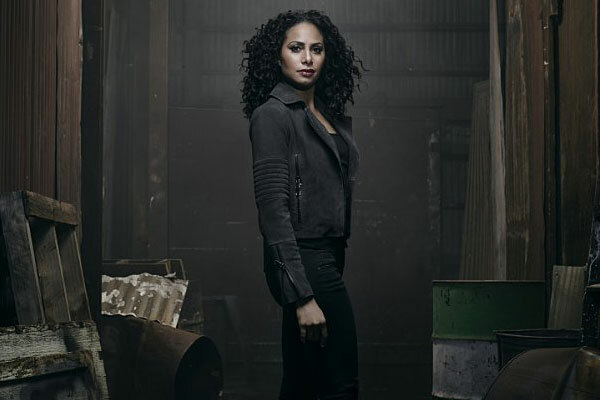 Christina Marie Moses: Well, I walked in with David Nutter and Julie Plec and read. They asked me to read again. I left, came back again another day and begin the testing process. Christina Marie Moses: Yeah, it was that quick. A lot of the times it can move really fast. It was fun. David is a dream to work with and Julie Plec is so smart, super encouraging and fun. Both of them are. We got to play in the audition room, in the testing room, which takes a lot of the pressure out of things and you can have a good time and hope for the best. Do we see any more of the back story for your character? Christina Marie Moses: We don’t see it, we talk about it. But we don’t see it. I’m actually hoping that we see more in the second season. I’d be curious to see the back stories of everyone, of all the characters and see how they came about and what makes them who they are today.